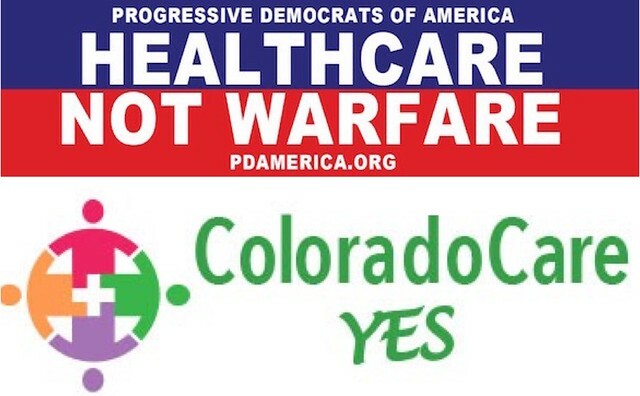 Join us on Saturday, December 10th, as we gather with our allies from the ColoradoCareYes campaign and PDA-CO to talk about next steps on the path to Medicare for all in Colorado. We will provide an analysis of the ColoradoCare, Amendment 69, campaign and discussion of where we go from here. While many may look at ColoradoCare's defeat at the ballot box in 2016 as a failed attempt to move single-payer, we do not see it that way at all. We have more than half a million people who will likely lose affordable access to healthcare once the Trump administration begins taking its marching orders from ultra-conservatives like Paul Ryan and Tom Price. We are not going to allow that many of our neighbors and friends to suffer—so, no, we are not done fighting for healthcare justice. We are not defeated. We are determined. Join us. We'll finish the afternoon with a vigil in solidarity with other PDA friends all over the nation as we relaunch the Healthcare NOT Warfare campaign in recognition of International Human Rights Day, and the Universal Declaration of Human Rights. Contribute to the PDA Healthcare is a Human Right Fund! Please donate $500, $50, or whatever you can now to support our organizing for healthcare as a human right. Our nation continues to neglect millions of people who are still suffering without access to quality healthcare. This is cruel, immoral, and unsustainable. PDA demands expanded and improved Medicare for All. We could easily afford to fully fund such a program if only we drastically decreased our massive spending on warfare, weapons, and military actions. Help PDA make needed progress on Healthcare Not Warfare. PDA demands that our leaders adopt peace and diplomacy as our primary policies, rather than regime change and military interventionism. We call on the incoming Trump Administration and the new Congress to fulfill our commitment to guarantee healthcare as a human right, and to end all foreign wars as well as the domestic war currently being waged against the Indigenous Peoples at Standing Rock and against all domestic at-risk populations." To emphasize our organizing and advocacy, PDA chapters nation-wide will hold public vigils and other programs on or around December 10th at which PDA supporters and allies will mark the 10th anniversary of the HNW Campaign. These events will dramatize our national failure to guarantee high quality healthcare as a human right, and will also commemorate International Human Rights Day while reminding us of our largely-unmet treaty obligations under the Universal Declaration of Human Rights. Human Rights Day celebrates the Universal Declaration to which the United States has been a party for 68 years, but which we have yet to fully adopt in policy or practice. Sadly, as we hope to enjoy the holiday season, we must prepare for expected extreme and regressive policies of the Trump-Pence regime. We must focus our attention on issues of war and peace while we prepare for impending attacks on healthcare. These vigils and other events will kick off PDA's renewed focus on championing healthcare as a basic human right and strong denunciation of warfare as an illegitimate policy. If you're thankful for all the organizing Progressive Democrats of America does for you, please donate $500, $50, or whatever you can to keep our movement growing. P.S. We're here to help you make progress in your state and locality! If you need help organizing a new PDA chapter or energizing your existing chapter, please contact PDA Field Coordinator Judy Hess.